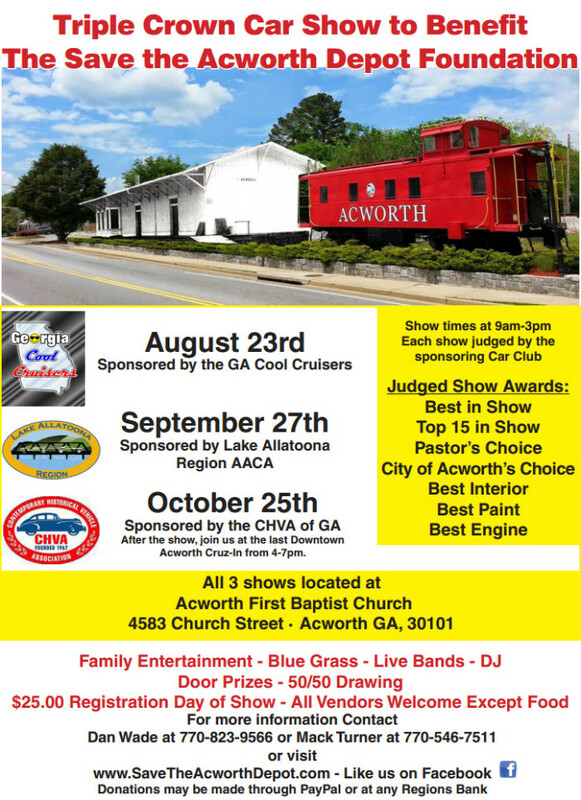 Help raise funds to bring the Acworth RR Depot back to downtown Acworth atthe Triple Crown Car Show to be held on 3 different dates late this summer. Three of our local car clubs are teaming up and need your support on all three dates at all three car shows. All makes and models of vehicles are welcome. The event also features family entertainment, blue grass, live bands, dj, door prizes, and more. October 25th – Sponsored by the CHVA of GA, and after the show, head over to the last Downtown Acworth Cruz-In from 4-7pm. The mission of Save the Acworth, GA Depot Foundation, and Inc.(STAD) is to rescue and restore the Acworth train depot through educating and communicating its historical significance; designing, refurbishing and relocating to a City approved and donated location in order to retain an important part of our heritageand provide our community with a lasting legacy. The vision of STAD is to adequately fund, acquire, secure and reconstruct the train depot. The depot will serve as a resident and visitors’ attraction and museum for the community and generations to come.